As many of my faithful readers know, 2012 was a turbulent year for me. This was a rock bottom year in which I had to make the choice of wallowing or rising above and forging myself into something new and better. I chose the latter route and while I am glad to see 2012 depart, I will always take the lessons learned with me. I look forward to 2013 being a stellar year – musically and personally. My year started with a resolution of writing more and being more proactive. I had a great start of the year till I made a poor decision one evening and went out, had too much drink and on my way home, wrecked my poor Paddy Wagon and was arrested for a DWI. The morning after, sitting in the impound lot, waiting for AAA to tow my car home, while filled with regret for my poor decision, I was quite thankful I did not hurt physically hurt anyone. It was at that time I made the commitment to sobriety. I was very public with my ordeal, my pain and my decision. While it may have been uncomfortable reading for some, I gained many words of encouragement and support that I cannot even begin to express my gratitude of receiving. Much it was from people in the Celtic Rock and Punk scene, which as many of you know, is quite alcohol fuelled giving me encouragement in my commitment to sobriety. For months my writing languished as I struggled to work on the demons that drove me to drink and other self-destructive behaviors that have not only hurt me, but those that I love. It was a constructive time for me – I learned much about myself, what drove me and my decisions, learning to trust in myself and gain the inner strength that I never knew was in me. Alcohol has always been a crutch for me. Something to hide behind, something to give me the false sense of strength. Once I stopped hiding who I was, channeling my inner strength, the decision of sobriety was easy. Over the next few months, I had to miss a few shows that rolled through St Louis – Cutthroat Shamrock, Mighty Regis and Red Rebel County as I was still in severe emotional turmoil. My first real test of my new life decision was going to a Whiskey of the Damned show. It was my first time in a bar since my fateful night. I went with my friend Ron, who I knew would have my back. My strategy that night was to bring my new camera and take pictures. As the night wore on and I watched some of the most inebriated patrons, I started to feel a strengthening of my conviction. At the end of the show, a quite drunk Eoin McCarthy was attempting to tempt me, to give up my choice and go back home with the band to go to college show full of nubile co-eds. Needless to say, I rejected the offer, knowing I was doing the right thing, not just for me, but for my kids. On my drive home, I drove with calm and peace with the knowledge that I had nothing to worry about it – as far as I am aware, there is nothing illegal with driving with excessive caffeine and nicotine. After the Whiskey show, I had to face my punishment and accept my loss of driving privileges. I unfortunately missed The Real McKenzies but accepted it with grace as I chose to make my whole experience a learning tool. Not something to bemoan my luck, the cops, the legal institution but to accept my failings and stand tall. Over the years, I had become disconnected from the person I was. I gave up not only my will, but my personality and my voice. I reached back to the last time I was alcohol free – my high school self. I held nothing back, I did not hide myself or my quirks. And during that time, as many of you know by reading (and may be tired of hearing of) “Poor Troubled Life” became the song that got me through the rough days, the song spoke to me like no other song had before. Come June/July, I got a message from Beau of Lexington Field they were going to be playing in St Louis in August, during the last two weeks of my restricted driving, which only allowed me to drive for employment or community service. So I could see the band, Beau agreed to hire me as a photographer for the show, so I could have a legal reason to drive. I wrote up a contract, had business cards made and included a pre-shoot consult the day before the show which was conducted at the Cardinals game. That night, Beau really encouraged me to get back to writing, that my voice was being heard. His words that night still help give me the drive to write. Since that night, I have worked to become more proactive – instead of waiting for bands to contact me and send me their stuff, I have utilized my Xbox Music subscription to find albums to review. I have written a few things to help spread the word about upcoming works. In all, as I have rediscovered myself and become more comfortable in my sobriety I have found my ease in talking to bands has not diminished. I no longer need the social lubricant, I just need to be myself. Going to the Weston Irish Festival – yes it was a long day, but it was a blast seeing Flannigans Right Hook up close when the rain ran them off stage. In addition, it brought back some good memories seeing Eddie Delahunt play. Third, it was great to see The Langers Ball play live and meet with the band and get some more grief over my views of their version of “Fields of Anthery” – I still stand by my point of view though! In general, the music community of this genre is outstanding! All the friends I have made, even virtually has been fantastic – I hope some day to meet you all in person! Some of my favorite albums this year, in no order of preference has Hoist the Colors, the Kilmaine Saints, the Killigans, Lexington Field, Flatfoot 56 and Celkilt. This year has been filled with great music and new friendships. I cannot even place a value on what has meant to me and the reforging of myself into something new and better. So with that I say Godspeed 2012 – you were rough on me, but you have taught me some invaluable lessons. So to all my readers and friends, I bid you a happy new year and slainte! Forged anew, the Red Wolf rises! Hey all, just a quick post to highlight a new page on the blog titled Upcoming St Louis Shows which I will work on keeping up to date with periodic reminder posts with updates to who I have added. For the next month and half, I have Rusty Nail, Red Rebel County, The Mighty Regis and a repeat visit from Whiskey of the Damned! The last live show I went was last months Whiskey of the Damned and I have been jonesing for another live show to see. Last week I found out the the Swaggerin’ Growlers were coming to town. Just what I needed! The Swaggerin’ Growlers are a 5 piece featuring the standard guitar, bass and drums plus fiddle and accordion with a mission to enjoy the road and bringing their brand of Celtic Punk. Their stop in St Louis was on the last leg of their tour that took them down the east coast to Florida then west to Texas and up to Kansas before getting here. After their last experience here of having no audience and someone attempting to break into their van, I am glad they gave St Lou a chance to redeem herself. The venue was at the Heavy Anchor, a neat little bar in south city that has a great selection of beer and nice strong pouring hand. The night’s entertainment was 3 bands with Swaggerin’ Growlers up second. Before they started playing I talked with Johnny Swagger for while and clearly his passion and knowledge shows. Meanwhile I think I may have been the only person who had heard of these guys and was there specifically for them. Not only are these guys great at their craft, they are great guys – they were friendly and funny and appreciative to the accolades of people who saw them. In conclusion, these guys are a must see and must have a drink with! I have to say 2012 is starting out great, first Whiskey of the Damned.and now Swaggerin’ Growlers! Next up is The Mighty Regis, scheduled to play late March with the venue not yet announced so I have good faith the trend will continue! 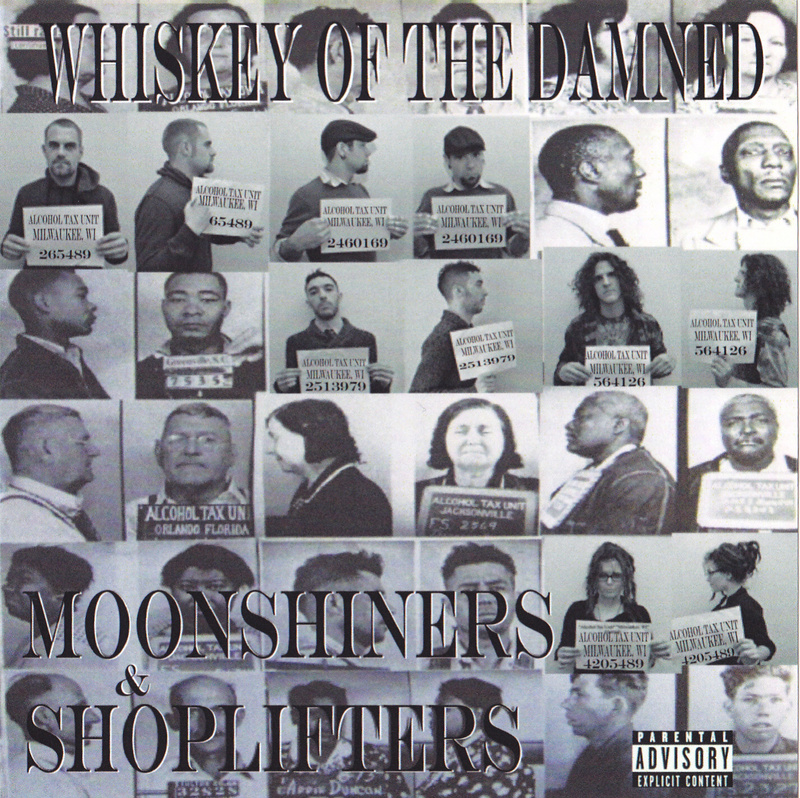 My introduction to Whiskey of the Damned, a 5 member band from Milwaukee, was swift. I woke up Thursday to a friend request from Eoin McCarthy and a message telling me they were playing at the Broadway Oyster Bar on Friday night. Without pause or thought, I told my lovely wife I had plans Friday night. I have been struggling to find the right words to talk about this band – they are absolutely incredible! Right from the start of the show to the very end they rocked the joint. My hand is raw from clapping. The energy and enthusiasm of the band was incredible and the love of the music was clearly visible. When Whiskey of the Damned comes to your town to play, DROP EVERYTHING, GRAB SOME FRIENDS AND GO! This is a must see band! While at the concert I purchased their new CD, Moonshiners & Shoplifters and I can already tell you this will be in heavy rotation. The music is infectious, I keep finding myself tapping along. Hands down my favorite song is Another Day Dead, the song has been stuck in my head since last night and I have been reinforcing by listening to it several times today already. My other favorite is Thump Keg, it sounds a bit like Cutthroat Shamrock which Whiskey of the Damned have played with according to Eoin when I talked to him at the show. The Wreck a slower tempo song that I see growing on me as time goes on. Again, as if I have not given it enough emphasis, drop everything you are doing and make it their show! Buy their CD!